The Namib Sand Sea is a coastal fog desert of high natural beauty. It consists of two dune systems, with numerous coloured dune fields. Sand is carried and deposited here from afar. Namib Sand Sea is part of Namib-Naukluft Park. 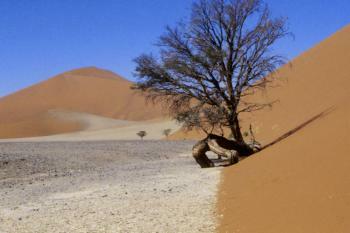 The most well-known part of the area is Sossusvlei, a salt and clay pan surrounded by high red dunes. The Namib Sand Sea is the most extensive example in the world of a coastal fog desert. It’s the kind of place nature documentaries rely upon. In David Attenborough’s ‘Planet Earth II: Deserts’ several scenes were filmed here such as the gecko licking its own eyeballs - where thaw had formed in the early morning - to get liquid. The site was inscribed on all 4 natural criteria and it is the undoubted highlight of a trip to Namibia. The designated area is enormous – about 75% of the size of the Netherlands. But only a small part of it is open to regular tourists. 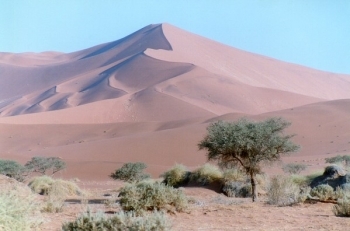 The common access point is at the east, at Sesriem and the Sossusvlei. Only few tour operators have permits to venture deeper into the Namib Sand Sea (they are named in the nomination dossier). We stayed overnight at the Sossus Dune Lodge, which is the only hotel within the park’s borders (there’s a camp site as well which has this privilege). This means that you’ll be in the park before sunrise and have all the nice spots to yourself for at least an hour or so. At 5.30 a.m. we were the first to start the climb of Dune 45, at 150m the highest of the red sand dunes along the Sossusvlei access road. Sitting at the top ridge we watched the sun rise, giving the surrounding dunes a deep red colour. Getting down from a sand dune of this height also is great fun. We then moved on some 10km deeper into the park to what is known as the ‘2x4 car park’. Here the vehicles that are no four-wheel drives have to be left behind. Jeeps will shuttle visitors for the final leg to the access point of Dead Vlei. We however hiked this stretch of 5km, right through the Sossusvlei’s barren clay pan and across some smaller sand dunes. It was a lovely walk which I would recommend to anyone over using the shuttle. A final hurdle is left for everyone after the Dead Vlei car park: there’s a 1.5km struggle through the sand, where you hope to see the famous white pan with the dead trees after each small hill. But it really is at the far end. At one point there may have been 50 tourists at the place at the same time, the pan is however larger than I had thought (about 100m across?) and there are plenty iconic dead trees to take pictures of. The whole place is terribly hot. We were done for the day at 11 a.m. At the late afternoon temperatures hit 46 degrees Celsius. Even at the luxurious Sossus Dune Lodge we had to develop all kinds of tricks to keep ourselves cool. There was only hot water coming from the taps in the rooms, so we filled our water bottles with warm water and then left the bottle in the freezer overnight. At the end of my tour through Namibia I was in the town of Swakopmund, just north of the Namib Sand Sea. From here, 1.5-2 hour scenic flights are offered over the whole inscribed area. They are quite pricey at 250-300 EUR, but I heard great things about them. Unfortunately, the minimum of 4 participants could not be met on the day that I wanted to go. Another option to try out for future WH travellers are the helicopter tours from Sesriem. The most well known part of the Namib desert/Namib sand sea are its salt/clay pans such as Sossusvlei & Deadvlei. However, from the park gates to Sossusvlei it is an approx. 70 km drive through the dunes (for 65 km on a tarred road). If you are at the gates by sunrise these orange dunes are a stunning sight. Also the 'vleis' (especially Deadvlei) are magical with white salt/clay, black trees, orange dunes and a blue sky. I was suprised no one has reviewed this site yet, as it is considered the number one destination in Namibia. I visited the area back in 1996. The « Namib Sand Sea » is a huge desert of sand dunes blocked between the semi-arid plains in the east and the cold atlantic ocean in the west. On an independant basis, the Sossusvlei area is the easiest to visit. Nowaday, I’ve read that there can be long lines to enter the park. Back in 1996, it was a solitary place. Sossusvlei is a magnificiant and magical area. A road, now tarred, is following a large white salt and clay pan deep into the sand sea. All around are numerous high pink dunes, some being more than 300 meters high. It is a photographer’s paradise. The road follows the bed of the Tsauchab river. The harsh and dry desert conditions prevent the river to flow, and the river bed is almost always dry. The road from the park entrance (in a settlement called Sesriem) to Sossusvlei is 60 km long. The last 5 km requires a 4x4 drive. For fit people, and with plenty of water (2 liters per person), it is pleasant to walk those last 5 km to Sossusvlei. It seems that there is now a shuttle service for those last 5 km. Sossusvlei is a clay pan that some year is flooded and transformed into a lake. In 1996, the lake was full, but the water was grey and did not reflects the hugh dune in its water. Climbing up the biggest dunes is possible either from Sussusvlei, or along the road. Foreigner prices: Naukluft Park: 30 Namibian dollar for Namibian nationals, 60 Namibian dollar for SADC residents (14 other Southern African states) and 80 Namibian dollar for other nationalities.